Have you ever heard of James Charles? I hadn't until this week. 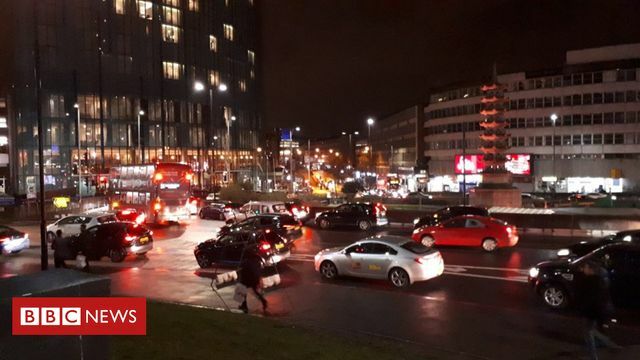 He's a 19-year-old Youtube beauty vlogger, with over 12 million subscribers to his channel, who managed to bring traffic to a standstill in Birmigham after doing a meet and greet. 8000 fans had turned up, hoping to catch a glimpse of him in the Bullring shopping centre. It was mayhem. I wonder if that would have happened in a smart city. No, I'm not insulting Birmingham (it's lovely, and the Bullring is very good for shopping). Rather I wonder if a smart shopping centre might have been able to predict the people flow by using geolocations from fans' smartphones and tracking hashtags, whilst talking to the grid to make sure autonomous vehicles were diverted to avoid the roads surrounding the Bullring. Those people who were stuck in a traffic jam last week could have been watching Netflix from the comfort of their back seat instead. I wonder how far off we are from this dream. I've had my own (comparably small) taste of pedestrian traffic mayhem in that I unexpectedly gathered 1000 sausage dogs and their owners in a London park simply through posting a couple of images on my dog's Instagram account about going for a walk with dachshunds. Turns out even having 40,000 followers can have a big real life impact and all it takes is a hashtag to gather a crowd. Yes, I have learned my lesson. Completely oblivious to this though was Mildred the Sausage, who, like James Charles, ended up on the news. To this day, she racks up more results than I do in a Google search, and she needs her own email address. It's a mad world we live in but it just goes to show the power of the platforms; they touch on so many aspects of our lives, and influence our future generations of leaders / dog owners. There's no ignoring the real life impact of social media anymore, so how can we best embrace it and integrate it into planning? How can it be used for good? Fascinating legal issues galore, of course!